Swim, Kayak, Surf, or Snorkel La Jolla Shores in the beautiful clear waters at one of the best beaches in San Diego CA. 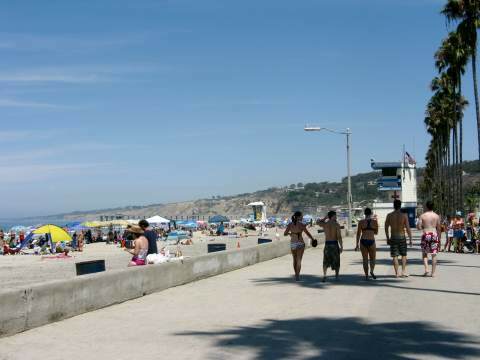 This popular beach is close to Scripps Beach, Scripps Pier, the Birch Aquarium and the charming village of La Jolla. This is one of my favorite beaches in San Diego. 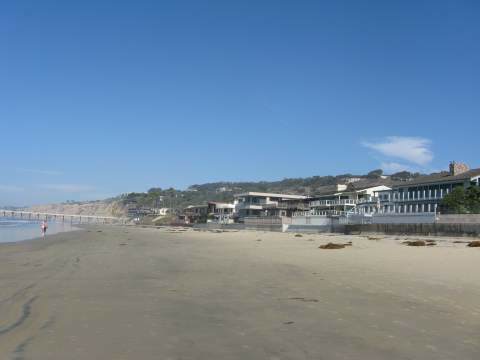 If you are looking for a great beach in La Jolla, or anywhere in San Diego, you can't go wrong with La Jolla Shores. This popular beach has the clearest water in San Diego, thanks to the kelp forest in La Jolla Underwater Park & Ecological Reserve. The beach slopes gently into the water, and the protected location makes in a calm beach, perfect for small children. La Jolla Shores is the largest beach in La Jolla Cal., capable of handling crowds of people who flock to it on summer weekends. The parking is free if you get there early enough to find a spot. At the north end of the beach by Scripps Pier is Scripps Beach, which tends to be less crowded. At low tide you can continue north to some tidepools, and all the way to Black’s Beach . A short walk from the beach is Avenida De La Playa, full of restaurants, surf shops, kayak rentals and whatever else you might need for a perfect day at the beach. Kayaking tours for the La Jolla Sea Caves leave from this beach, as do many open water swimmers on their way to La Jolla Cove. Parking: Large free parking at Camino del Oro near Kellogg Park, but it fills up fast. Free street parking available, but you may need to drop your group and gear off first, as on summer weekends you may have to park several blocks away. Getting There: Short walk to this easy-access beach from main parking lot. Things to Do: Walking, jogging, roller blading, sunbathing, swimming, bodyboarding, surfing, surfing lessons, beach fires in firepits, snorkeling La Jolla waters, scuba diving, open water ocean swimming to La Jolla Cove, kayaking La Jolla Sea Caves, swimming with leopard sharks, explore the La Jolla Underwater map near the playground, picnic in the park, explore the tidepools north of Scripps Pier. 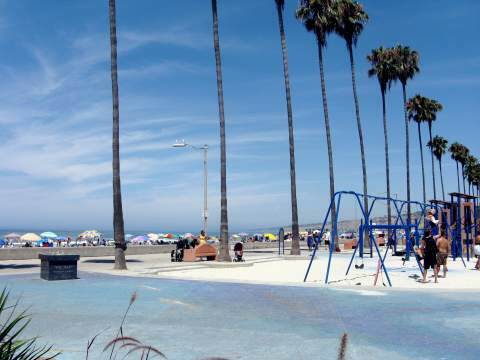 Facilities: Restrooms, showers, changing rooms, trash cans, concrete boardwalk along the beach. Services: Many restaurants, bars, surf shops, rental shops (snorkel gear, kayaks, bicycles) along nearby Avenida de la Playa. Best Restaurants: - Check out the restaurants nearby on Avenida De La Playa. A great happy hour and fine dining restaurant is the Marine Room restaurant which overlooks the water, 2000 Spindrift Drive, La Jolla, CA 92037. Call ahead for reservations (858) 459-7222. Dogs: Leashed dogs are allowed before 9 AM or after 6 PM (4 PM from Nov. 1 - Mar. 31). 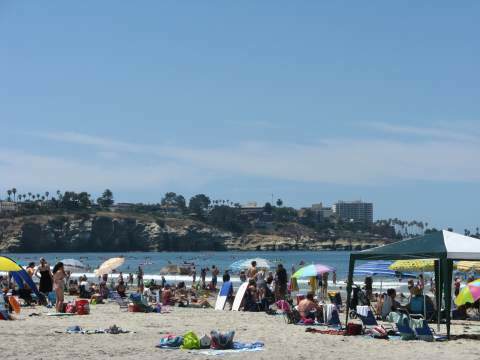 Hazards: Sunburn because you won't want to leave; rip currents can always be a hazard in the San Diego beaches, but La Jolla Shores has is a gentle sloping beach in a protected cove, so this is less of a problem than other beaches in San Diego Cal. "The Map" is an interpretive map illustrating the La Jolla Underwater Park & Ecological Reserve topology, animal species, dive sites and other underwater features of the area. The cool SD map was completed in September 2008 with assistance from Friends of the Map, the local San Diego Scuba Diving community, and La Jolla Parks and Recreation. Explore the 30-foot (9.1 m) by 75-foot (23 m) lithocrete map and learn about the San Diego La Jolla Underwater Park and surrounding La Jolla beaches. The colorful map is located near the beach boardwalk between the restrooms and the children's play area at the South end of Kellogg Park (partially visible in the photo above). La Jolla, California is a popular tourist destination and has many vacation rentals. To find a La Jolla vacation rental, click on the image below. The La Jolla Shores San Diego CA beach hotel is right on the lovely La Jolla Shores beach. Location, location, location makes this a great San Diego beach resort. You can enjoy the swimming pool, jacuzzi, in-room massage services, tennis, and of course the beach activities. The hotel is right on the beach and you can dine at the beachfront The Shores Restaurant. This is one of the best San Diego beach front hotels, right on one of my favorite beaches and you are right where the action is for all the beautiful La Jolla beaches. At the south end of the beach is the La Jolla Beach & Tennis Club, with a private beach, heated outdoor swimming pool, 12 championship tennis courts, par-3 nine-hole golf course, massage services (including massage, facial and aromatherapy), beach activities and fine dining. The La Jolla Beach and Tennis Club also offers memberships, and there are reciprocal membership privileges with other clubs, including Coral Casino Club, The Hurlingham Club, Royal South Yarra Lawn Tennis Club, and Rot-Weiss Tennis Club. Directions – from Interstate 5 go west on La Jolla Village Drive, left on Torrey Pines Road, right on La Jolla Shores Drive, then left on Vallecitos. The free parking lot near Kellogg Park is to your right. The lot fills up fast during the summer, especially on weekends. There is free street parking along neighborhood streets - sometimes I've found good parking on La Jolla Shores Drive, or several blocks on the other side of it, so you might want to unload your beach umbrella, ice chest and the gang at Kellog Park while the driver hunts for parking. If you want to see the surf and kayak shops nearby, try this alternate route for driving directions to La Jolla Shores: from Interstate 5 go west on La Jolla Village Drive, left on Torrey Pines Road, right on La Jolla Shores Drive, then left on Avenida De La Playa to check out the shops. To park, go right on Camino Del Oro two blocks to Kellogg Park.